From the archives: This is a foundation post for anyone interested in Japanese style bentos based around rice. Edited and updated to reflect some safety related questions. Be sure to read the linked bento safety posts too. Originally posted in October 2007. Rice is the base carbohydrate for most Japanese style bento lunches, but the idea of cooking rice fresh every day may be rather daunting. If you have a rice cooker with a timer that can be set so that the rice is ready when you want to make your bento it is easier (and recommended if you make bentos daily). Of course this does mean that you need to rinse the rice the night before. While I prefer to wash the rice the night before and set the timer on my rice cooker, I often freeze pre-portioned packets of rice to use on extra busy mornings. Rice freezes very well if you make sure that it’s still warm when you wrap up the portions. This retains the necessary moisture inside the plastic. It’s also a good idea to use sturdy, microwaveable wrap such as Saran Wrap. I pre-portion the brown rice that I cook 5 cups at a time in a pressure cooker into 1 cup and 1/2 cup portions, using scoop-style cup measures. (I usually do this during the weekend.) After wrapping in the plastic wrap (cling film), I leave them until they have cooled down, then then double-bag them in zip bags and put them in the freezer. (For the environmentally conscious, the zip bags can be reused several times provided you don’t puncture them.) This amount lasts the two of us 2 to 3 weeks. To prepare a bento box, I use a 1 cup portion for myself and 2 cups or 1 1/2 cups for the bigger guy, re-heated in the microwave before stuffing into the box. Pre-portioning rice like this really helps to control portion sizes; when you’re in a hurry in the morning and scooping hot rice out of a cooker, portioning into a cup becomes a hassle. You may choose to bring the frozen packet as-is, especially if you have a microwave at work. I prefer to re-heat the rice in the morning because I often find that the frozen packet is ice cold at lunchtime, which isn’t very pleasant. If you do re-heat the frozen rice in the morning, be sure to cool it down again before closing up your bento box. Warm rice leads to condensation. Condensation within a closed bento box is the main cause of spoilage. I usually pack the rice in my bento box first, then leave the box open to cool down while I prep the rest of the contents. If you want to be extra safe, pack the bento box with a small ice pack, and/or put a single umeboshi (salted pickled plum)  in the middle of the rice. The umeboshi in rice is the traditional way of keeping rice fresh. Umeboshi are available at any Japanese grocery store. (You don’t have to eat the umeboshi if you don’t like it - just throw it away.) See also: Keeping your bento lunch safe . The shorter the grain, the moister the rice is and the better it seems to freeze and recover from freezing. So Japanese style ‘sushi’ rice or medium grain rice, round glutionous rice, other medium grain rices like arborio, vialone and ‘pudding’ rice, freeze well. On the other hand long grain rices such as jasmine rice, Carolina rice and basmati rice tend to get hard and dry. If this happens to your frozen rice, you can make it more edible by turning it into fried rice. See also: Looking at rice . 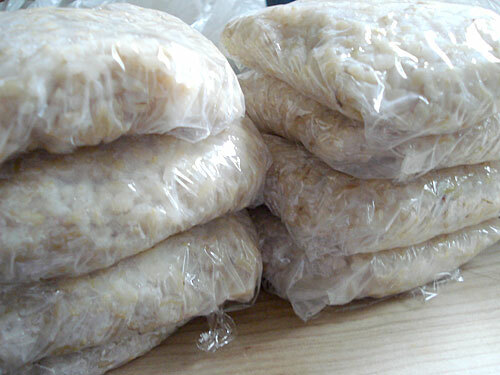 Pre-made onigiri  (rice balls), without the nori wrapping, can be frozen successfuly using the guidelines above. Just wrap each warm onigiri securely in plastic wrap and freeze. If you use the cling film method  of making onigiri, you can use that to wrap up the onigiri as soon as you make it. Don’t freeze rice balls that have been wrapped in nori seaweed though, unless you like soggy nori!